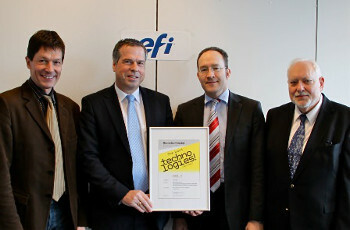 Marc Verbiest (left), Georg Hollenbach, Bernhard Niemela and Kurt K. Wolf with the International Print Technology Award 2012-2013.EFI™ has been awarded the 2012-2013 International Print Technology Award by Deutscher Drucker. The prize went to EFI’s Digital StoreFront, Pace, PrintSmith, Monarch and Radius as one integrated package of management information systems (MIS/ERP) and web-to-print solution. EFI MIS was the winner in the prepress category conducted by an online vote in which 1,643 readers of the Deutscher Drucker, Deutscher Drucker - International Edition, Grafische Palette and print.de participated. The voting took place in October and November 2012 at the print.de website. On the 18th February Bernhard Niemela (managing director of Deutscher Drucker Verlag) and editorial staff member Kurt K. Wolf presented the award to Georg Hollenbach, general manager of EFI Germany and Marc Verbiest, international Public Relations manager. "Using Digital StoreFront, every printing house can create their own website and web shop to help process orders made online by their customers”, explained Hollenbach. “Digital StoreFront can also be installed at the customer site so employees can send their documents to the printing house. Pace is a fully integrated, browser-based software product developed especially for the print and media industry. EFI pointed out that it streamlines jobs from end-to-end - from calculation to dispatching, for conventional, digital or large-format printers. The company said the Monarch product manages and automates multi-site print factories and Radius meets the specific requirements of the packaging industry." "AT EFI, we are truly honoured to receive Deutscher Drucker's International Print Technology Award - it gives invaluable recognition to our EFI MIS systems which companies everywhere use to seamlessly integrate and automate their processes," added Verbiest. "We are in a strong position already and we are committed to the continued development of these products to support the business growth of our customers."